Friday afternoon... the hall is not ready yet. By tomorrow, these will be filled. All needs to be organized. Over 6 hours later, it's organized! Organizer Steve Cortez (left) scans the arcade before the show. A map of the interior. Guess where we are?! The sales vendors are in full swing. 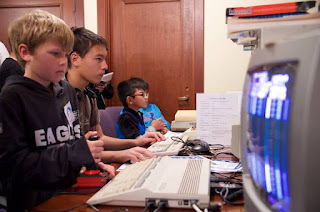 SCCAN member Sev tests out his Amiga 1200. ...and the bar in front of the live music. Fly a jet with the A1200! Some attendees liked to read the specs. Tim W., Richard G., and Nolan G.
The January 5-6 Retro City Festival in Pomona, California, attracted thousands of attendees who wanted to play the arcade games and pinball machines. http://retrocityfestival.com They were also surprised to see the bank of Commodore and Amiga computers that members of SCCAN brought to exhibit. There was a steady flow of attendees to use the computers, but it was not overwhelming (which is good because I was usually the only one to man the tables!). In fact, I had to get the other non-club computers going, too, like the NeXT and the Apple II. We've been invited to next year's festival! Now that I know what to expect, I'll be better able to unload and set up the computers more quickly. 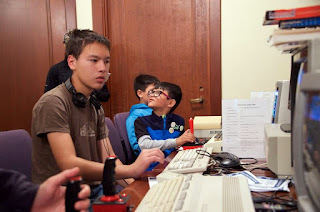 Jerold Kress lets attendees play music on C64 + Cynthcart. The exhibit was really, really popular! Jerold gives a talk on composing music. The 2018 DTLA Maker Faire was a huge success not only for the event but also for the exhibit that we had there. 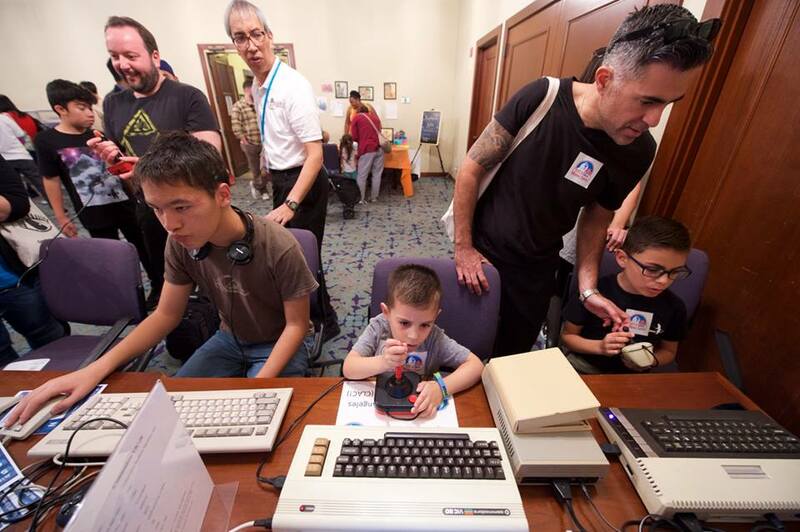 https://dtla.makerfaire.com/ We set up the Classic Los Angeles Computers exhibit with a brown Commodore 64, a Commodore 128, an Amiga 2000, and an Atari 800XL, and we were showered with computer love throughout the day. 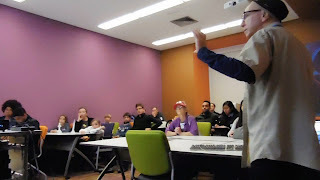 People were actually in line to use the computers! The busiest times were the late morning and middle afternoon, and I didn't take a rest throughout that time, helping and answering questions about the systems. 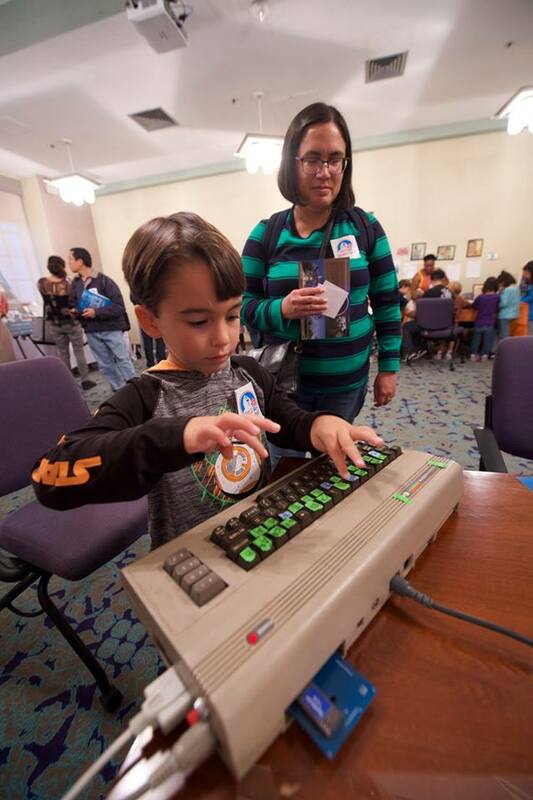 The attendees had a big need for classic computer support, and I did my best to help them with computers not even at our exhibit, like Apple and IMSAI. My thanks to SCCAN members Mario L., Rory M., Jerold K., and Jenna for lending their support. The library seemed very pleased with our exhibit, and I have promised the exhibit will return for 2019.